If you are an electrician undertaking extensive projects or a home DIY enthusiast changing a plug, then having the right electrician’s tools is essential. Using the right tools gets the best results and saves time, and hence money. 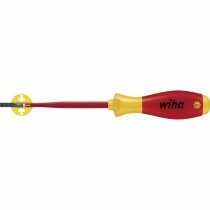 Within the variety of tools that we offer, you will find Wiha products that are of a professional quality. Their electrical screwdrivers are of varying designs and includes slotted and pozidrive types. 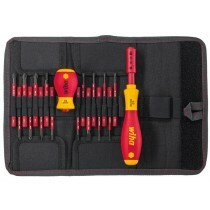 If you require a full set, then choose the 18 piece Wiha screwdriver set and save money in the long run. When carrying out your electrical work you may need a voltage tester. The Roebuck VDE screwdriver is an excellent choice for this. When you need to purchase electrician’s tools, you can simply select the item you need and add it to your shopping cart. If your order exceeds £20, then we will deliver your order free, to any UK mainland address.